Company was thorough in the replacement of our roof. Would highly recommend this company. Welcome To One Call Roofing! Since 2003, One Call Roofing has delivered quality-certified workmanship, the best materials, and unparalleled customer service for a new roof replacement or roof repair. You only have to make, “One Call” for your home or commercial roofing needs. No other local roofing contractor matches our insurance assistance. They can’t equal our customer service or quality workmanship when you buy a new roof from us. 24 / 7 / 365 EMERGENCY SERVICE! Call 205-370-9450 for fast, friendly service. 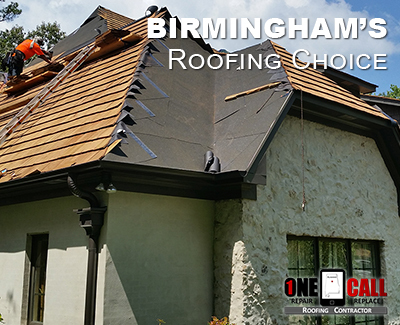 Whether you need roof repair or a roof replacement, Birmingham Roofing Contractors should be licensed, insured and reputable; we are! One Call Roofing is trusted for using the best quality roofing materials. We take the time to ensure proper roof installation and thorough roof repairs. Our real roofing customer reviews, BBB A+ rating and Angie’s List reviews make us a great roofing contractor choice in Birmingham, AL. Did you know that we’re quality-certified for home and business roofing services? In addition, we are a Master Shingle Applicator contractor; our certification is from CertainTeed, the premier roofing manufacturer in the world. It means they have judged the workmanship our customers receive to be of the highest skill, which protects their reputation for peak-performing roofing materials. This entitles you to Certainteed’s best warranties. You’ll know your new roof is backed by the best in the business. Our commercial roofing division specializes in TPO Roofing and only uses GAF roofing products. If you have a flat or low sloped roof on your building, we can install a roofing system that will last for decades and at a great price too! We can replace your roof with asphalt shingles, metal roofing, cedar shakes, flat roof coatings and TPO or PVC membranes. If you haven’t already heard, we’re one of the largest commercial roofing systems installer in the state of Alabama! We don’t just “plug leaks”; we provide permanent solutions. We make certain water can’t get in any more. Structural damage will be restored. And, while on your roof, we prevent future problems– before you have a roof leak. Our full-service crews don’t use half-measures. If your problem is covered by insurance, you have a partner. Some homeowners don’t know that they are entitled to choose their own contractor to deal with insurance companies. We have made representing you during the insurance procedure one of our top priorities, and have trained all of our staff in how to handle the process. In most cases, your deductible is all you pay. The weather in Alabama can get pretty severe at times and cause damage to your roof. When it does, you need professional roof repair at any time of day or night. So whether your roof is damaged by the high winds of Hurricane Michael or a dangerous hailstorm in Spring or Fall, you’ll get affordable storm damage repair at a fair price. You can cut your air conditioning costs by 30% installing a modern metal roof. It is designed to reflect the sun’s rays. When heat bounces away, it is not passed through to your interior. These roofs pay for themselves. The wind strength is engineered in. The panels interlock. Wind can’t get up and under to whip them off. Metal offers superb hail protection and is fireproof. No-maintenance metal: You never have to have it painted or sealed. Metal won’t mold, mildew, and has been made corrosion resistant at the factory. It’s perfect for industrial and commercial buildings. When your roof is more than 15 years old, suffers storm damage or is constantly leaking; it’s time for a roof replacement. We will tear off your old roof, make any necessary repairs to the wood decking, replace pipe boots and vents, then install a long lasting new roof. We can replace shingle, metal, tile and slate roofs quickly and affordably. In many cases, your homeowners insurance may pay for the replacement. Last-generation metal roofs may spring leaks. We recommend what are called “elastomeric” roof coatings. Acrylic coatings go on as a liquid over the existing metal. They dry to a seamless, waterproof, clean and modern coating that prolongs the life of your roof. We will also replace metal panels with traditional metal roof techniques. You need shingles fixed for many reasons: storm damage, leaks, and aging. Wind, hail and rain take a toll on older shingle roofing. You may see that an area of your roof is “balding” (losing granules). Call us before it’s too late and you have significant damage UNDER the roof and into your property. It’s important to us that your new roof lasts for a very long time. By installing Owens Corning Pro Cat Attic Insulation and making sure it is vented properly, we help to ensure it will. Keeping your house dry and energy efficient should always go hand in hand. Having the right type of attic ventilation system will only make things better. It shouldn’t be a shock to you that we provide professional rain gutter replacement. Since they’re attached right along the roofs edge, we’re often asked to install new vinyl, aluminum or copper gutters along with a new roof. Be sure to ask us about it when we come out for an estimate. When you purchase a new roof, you should know we do Home Maintenance as well. If you need sheetrock work or painting inside or out; if you need siding work or re-flashing; if you need trim work inside or out; if you have rotten windows or moldings –we will give you a written estimate toward these repairs. As a licensed and insured contractor, we do it all. of new roofs and roof repair! Call 205-370-9450 for a new roof or roofing repairs. 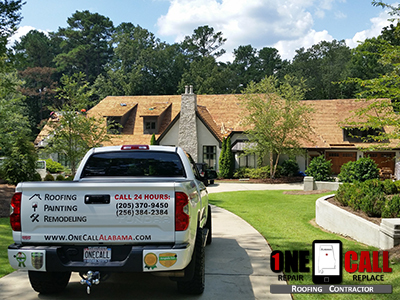 We are the top roofing contractor in Birmingham Alabama, Homewood, Bessemer, Alabaster, Hoover, Mountain Brook and Vestavia.